Android smartphones are getting so popular now and it became the major operating system in the world. We have to protect our data in mobiles from unwanted persons and we must secure the mobiles from being stolen or lost to someone. There are many lock types can be used in Android mobiles including pin lock, pattern lock, and slide lock and more. There are so many lock screen and password apps available now but we have to see an innovant application that provides better security than any other apps. 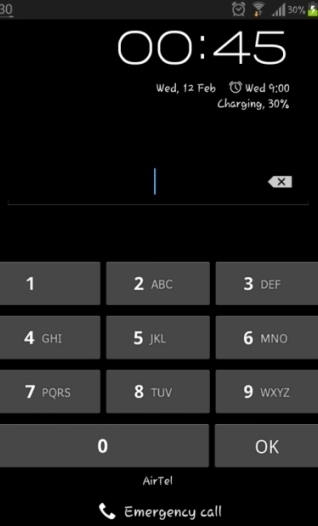 TimePIN is an Android app that sets your lockscreen PIN code to the current time. It is different from other lock screen applications because it changes the password for every minute based on the time of your phone. * Don’t worry to enter your password when your friends are watching that. * Default PIN can be used when your phone locked out and restart. For instance If your device time is 05:35, your password becomes 0535, or if you are using 24 hour format and the current time is 21:45, then you have to enter the password as 2145. 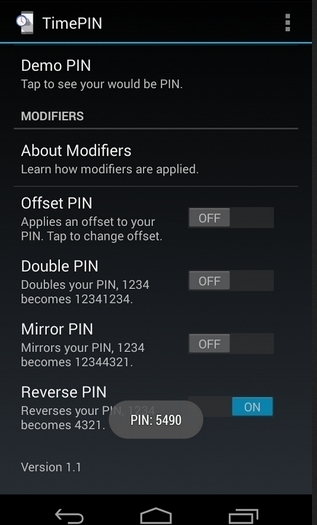 There are many modifiers to morph the PIN everytime, to enhance the security and difficult to guess the password. 4. Offset - It generates the password based on time and subtracts that with a particular number that already chosen by you. If the time is 10:43, and your offset is -121, your PIN will be 0922. TimePIN is available for free to download but you can use reverse modifier only in free version. If you need more modifiers, you can buy this app for $1.99 with in-app purchase. The developer announced more features including pattern passwords, alphanumeric passwords will be coming soon.